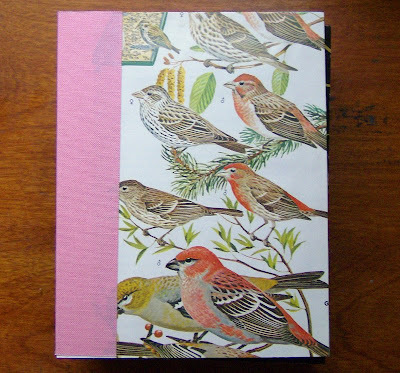 I just listed this Rosy Finches Notebook in the shop. Aren't they pretty? The birds pictured above actually are not rosy finches, those are red finches and gold finches. The rosy finches are on the back cover, and they are really pretty, so you should take a look at them. You can see them and other new (super cute) notebooks that are not yet in the shop on my flickr page. Beautiful! Aren't books soooo much fun to make?!! I have some listed in my shop as well! hyla - I absolutely cannot stop making books. It's addictive!